When we moved to Dedham, my father used to take the commuter train home. He said the pickle vat was open at the top, and you could see the pickles. Which made no sense to me - how could that be hygenic? Just recently, I happened to read that pickles were traditionally made in open vats for some reason. I think the station buildings had all been taken down to prevent vandalism. I'm pretty sure the stairs were fenced off at the bottom to prevent access. Many granite blocks were saved and used at Franklin Park and Jamaica Pond to prevent auto access, and along the Southwest Corridor park. Here are a couple of nice colored postcards showing Forest Hills as it existed around the early part of the twentieth century. The El has not arrived yet in the first two, which are @ circa 1900, but we've got an active commuter line courtesy of the New Haven Railroad which stations almost exactly duplicated the Orange Line's now. 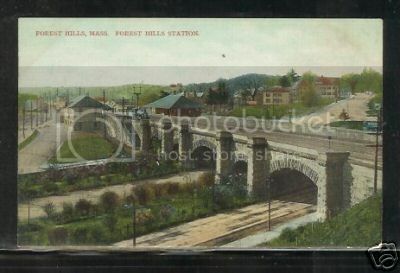 In the first card, that's Forest Hills Station on the right. 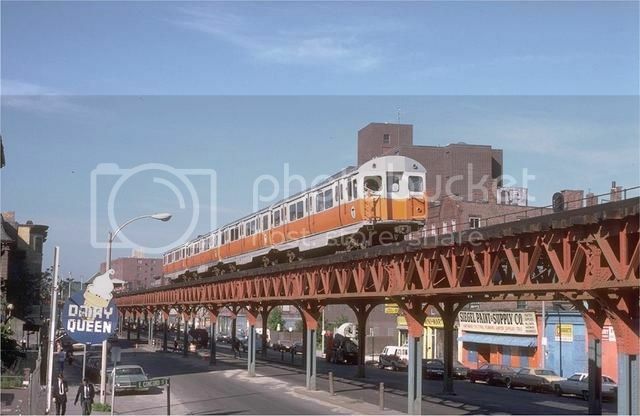 Any of you folks that were around the area before '87 will recognize that that's the ramp that was later used by the Forest Hills Taxi Co. To the rear of the station is the Tower for Forest Hills, which controlled all the movements, including splits from the Boston-Providence Main Line to the Dedham and Needham Branches. In the middle of the picture is where the Forest Hills El Station will be built. The large creme colored building was a large hotel in the Morton and Minton Block, and I believe that it later burned to the ground. Just in front of the hotel is where Washington Street and Walk Hill Street make the split, and Washington Street goes under the railroad right of way. The second card is the same view, just a few feet north. It shows the beautiful granite block archways which were built into the railroad's overpass to allow for pedestrians, two streetcar lines, and carriages. 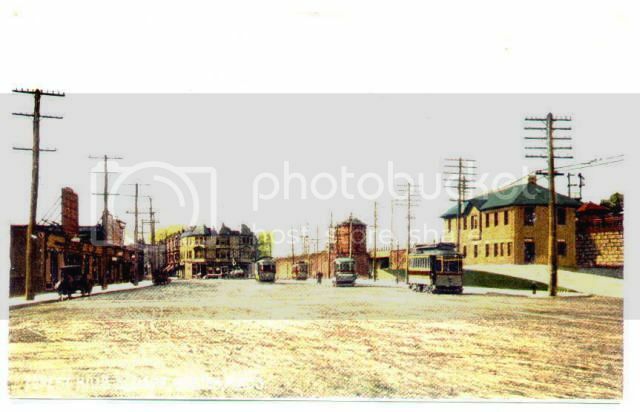 Looking at the third card, we are now looking towards the north from the other side, viewing the Forest Hills El Station when it was fairly new, circa 1923. It's copper cladding has apparently darkened but has not reached that verdigris stage that I and others will remember. If you look northerly out at the El structure after the station, you will see the Shea Yard ramp used by rapid transit cars to the Arborway. 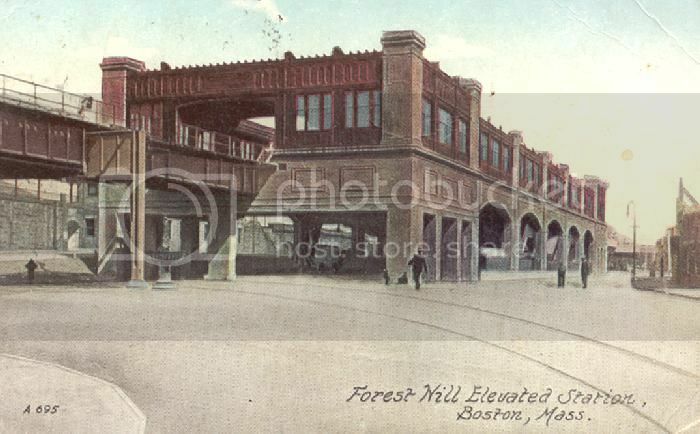 Forest Hills was a major catylist in the population and development of Roslindale, West Roxbury, Hyde Park, and Dedham, energized especially when the BERy Co. installed their station. Thank you, Paul! Great pics! I still think you've got more than enough material for a book (or few), if you ever feel the urge! Teamdriver - What was the name of the joint where Siegel Paint and Supply is in the photo ? E.Concord/Wash. Louie's Lounge, Basin Street South, Big Jim's Shanty ? (I seem to recall Basin Street South there.) Was it out of the nightclub business by the time that you started your gig ? I remember it as a happening jazz club with music so brassy that you could hear it in the El car as you approached Northampton. Once again, my regret is that I was born too late as I would have loved to have spent a night inside (with Mr. Sig). Go raibh maith agat, do dheagh shlàinte, my friend. Tá failte romhat , my Rail ! OK, so that's roughly five miles with a total of 22 bars = @ 5 bars per mile. Impressive ! Take that, Dot/Southie ! Can anyone name any more ? Wow, Harry the Greek's hasn't been there for years ... great old photos. I miss the Premier Deli down there ! Best cole slaw on earth ! Bar# 24 - Two O' Clock Lounge. There was one across the street from the Premier at the corner of Dover,I just called it The Gentleman's bar, and maybe across the street from that, on Washington , the Palm Gardens? , which might have moved down Dover to the corner of Shawmut. And in that area the Red Fez. Wasn't there a Mellen's Tavern at the corner of Washington St and Mass Ave? 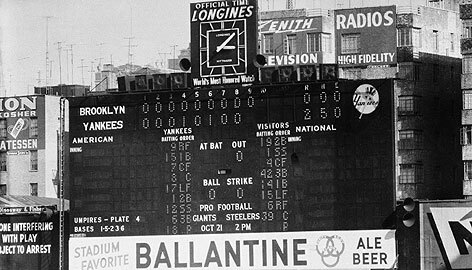 I think it's the one I remember seeing it from the train when it made the Northampton St. stop. There were usually a group of disreputable looking people hanging around outside.